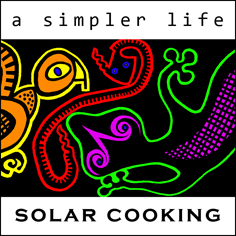 I’ve added this page because I’m hoping to discover it is possible to cook with the sun. So far it hasn’t been possible. For two reasons. It’s totally different to conventional cooking, there are no givens, you are totally at the mercy of the elements. And I have no idea how to start thinking in this kind of way. So, as I mentioned on the page about building our solar cooker, what matters most is where you live. I’m making a wild guess here, but anywhere more northerly (colder) than latitude 38 degrees and it will prove pretty hard going if not impossible. We haven’t tried any cooking with it this year (the weather has been too variable), but discovered last year that you need at least 190C for baking. Our first experiment was with chocolate chip cookies (biscuits). We reckoned 40 minutes would be enough (double the conventional cooker time), but they came out burnt on the top and were undercooked inside, so subsequently turned them over half-way. The oven needs to be pre-heated too, and the item to be cooked placed as close to the underside of the glass as possible. 6 tbsp of spelt flour/ 1 tsp baking powder/ 2 tbsp oil/ 3 dsp honey/ 50 gms of vegan chocolate (broken into tiny chip-size pieces)/ water to make the dough. Mix together and roll out/ cut into shapes. Lay on black baking sheet directly under the glass. Spurred on by this we then tried baking bread (this is before we got a thermometer). Not easy, despite all the claims on the internet. Took four attempts to get anywhere near an edible loaf (though we did eat all the failures), major problems being the top always collapsed after the first hour, and getting it to cook right through was impossible. Ended up doing away with the traditional loaf shape tin, and opting instead for a thinner and wider profile, aka the pizza shape, using a cast-iron frying pan. As always, positioned as high up in the oven as possible, and not opening the glass top until cooking time is over. We estimated this to be when the glass was free of condensation and the loaf had parted from the side of the pan. 3 hours seems to be the average, and done at the hottest time of the day. Check orientation of the oven and angle of the reflector every half hour. Mix ingredients together in a 1 ltr measuring jug. Allow to cool (until temperature same as finger), then add 2 tsps of dried yeast. When this starts to bubble add a cup of spelt flour. Allow to rise to the top of the jug, then transfer to a large mixing bowl. Add flour and mix together until the dough becomes almost dry enough to knead without sticking to your hands (too dry and it won’t rise). Sprinkle flour on the dough as required to keep hands from sticking, and knead for a few minutes (5 is sufficient). Then leave to rise (somewhere warm – above 25C – though not in direct sunlight) until doubled. No more than an hour though. Knock back and leave to rise again (half-hour maximum). Turn into the oiled frying pan and place in the cooker. After cooking take out and leave for five minutes, then run a knife around the edge and turn out. The base will still be slightly damp, so just pop back into the oven for 15-30 minutes upside down to dry it. What we’d like to have a go at next is some kind of casserole cooking. Though in order to save endless experiments we’d like to hear first from anyone who has already done this successfully. I guess it will also need a dark coloured cooking pot. Suggestions please for that, something inexpensive and safe.